The Kentlands community in Gaithersburg is moving toward organic landscaping, an effort to reduce chemical application options and provide a healthy environment for pets and children. Kentlands is consulting with Paul Tukey, an organic landscaping expert, who envisions maintaining at least 50 percent of the landscape organically by 2015. For more details, see article in The Town Courier. Go Green without breaking your bank! Here are some tips to go green and save money for the school year. Re-use textbooks — Re-using textbooks is a great way to save paper and it also reduces the amount of junk we have to dispose later on. Some websites such as SwapTree.com, PaperBackSwap.com, and Bookins.com let you swap books with others. Do your laundry in cold water — In the warm seasons, you can save tons of energy by washing clothes in cold water. By washing clothes in cold water, you decrease your electricity usage which is required to heat the water. This reduces your overall carbon footprint. Recycle your cell phones — Instead of discarding your old phones in favor of a new and updated one, recycle your phones because certain small parts of the phones can be used for other items. Shop at thrift shops — You can find just about any item in a thrift store and they are usually extremely cheap. Also instead of throwing away your clothes, think about donating them to a thrift store so other people can enjoy it for a much cheaper price. Keep indoor plants — Keep a small plant inside your house near a window. It is an efficient way to release more oxygen into the air, therefore purifying it. Perfect for your health and environment. Go to the farmers market — Make sure you go to the farmers market or any local market! It is a great place to get fresh and good quality food. It also promotes local farmers and produce. To find out about more tips, check out this article. In setting fares for the Metro public transportation system, the Metro board attempts to balance the the goal of providing the best possible service on it trains, buses, and vans for their riders and how to minimize the impact of fare increases on its customers, especially among those who are financially vulnerable and depend on public transportation. Environmental Film Festival — March 18-30, at numerous DC-area venues. The theme of the 2014 Festival — Our Cities, Our Planet — will examine the challenges posed by Earth’s urban environments and the efforts of the world’s cities to balance environmental and economic needs. Montgomery County Business Recycling Seminar — Thursday, March 27, 9 am – noon, Silver Spring Civic Center. Meet county staff and get all your recycling questions answered. Wheaton Green Drinks — Thursday, March 27, 5-8 pm at Limerick Pub. Rock Creek Extreme Cleanup — Saturday, April 5, 9 am – noon. Join Rock Creek Conservancy for its 6th annual volunteer cleanup event. Although there are still issues to work out, a development plan is taking shape for downtown Bethesda. The Montgomery County Planning Department is updating the 20-year-old Bethesda Downtown Sector Plan to manage future building and zoning decisions in the area. The Department recently hosted a workshop for residents, planners, and developers to help them move forward with their plan. Guests were asked to determine where the exact “heart of downtown Bethesda” was on a map on the wall and where the most troublesome areas were for pedestrians. Discussion also included changes that attendees thought needed to be made, with most saying there was a need for more green space. Downtown Bethesda is growing rapidly; in fact, it is expected that between now and 2040 the population will double. To get all the details, check out the Gazette. President Barack Obama’s new budget plan includes $100 million in federal construction money for the proposed light rail Purple Line Project, an infusion to help keep the $2.2 billion project on schedule. Also, the Purple Line Project was recommended for a full funding grant agreement, a long-term construction commitment that Maryland officials hope will amount to $900 million in federal funding. Purple Line construction is scheduled to start in 2015 and open in 2020. Some of the advantages of the proposed plan would be faster and more reliable transit options for traveling east-west between suburbs and would encourage new investments around stations in older suburbs. Opponents of the project say that the construction would require cutting down hundreds of trees in popular trails and would bring noise pollution to residents living along the route. The town of Chevy Chase has been leading the opposition to the Purple Line Project because it would require condemning 116 homes and businesses; they also believe that the state hasn’t done enough to explore other options. The Purple Line would consist of 21 stations with two-car trains mostly running above ground. Read the Gazette article here. Addendum: Council members call for Purple Line community task force (see article here). Climate change is becoming more apparent to farmers and gardeners because their farming or blossoming seasons are becoming unpredictable and unreliable. Last week, several horticulturists, biologists, and environmental activists met to discuss ways of adapting to climate change. They were part of a conference called “Green Matters 2014: Gardening in a Changing Climate” in Montgomery County. Precise temperature and weather are key to growing healthy crops and plants but with the increasingly severe and erratic weather, the plants are susceptible to death. Farmers and planters have to worry about temperatures dropping below freezing and damaging their crops. There is not much farmers and gardeners can do except respond to the changes they see. With higher temperatures, new pests can now survive farther north and at higher elevations than normal. For example, the mountain pine beetle, which is normally found in western forests, is beginning to spread. It and many other species could start invading Maryland. The Chesapeake Climate Action Network leads efforts to fight climate change through political activism and encouragement to reduce fossil fuel consumption. Raptors of the Chesapeake Bay: Past, Present, and Future Outlook for the Bald Eagle and Peregrine Falcon — Lecture, Thursday, March 13, 7 pm, Annapolis Maritime Museum, 723 Second Street, Annapolis. Speaker: Craig Koopie, Raptor Biologist, U.S. Fish and Wildlife Service, Chesapeake Bay Office. Free for certain Museum members; $10 for the public. 5th Annual Davidsonville Green Expo — Saturday, March 15, 10 am – 2 pm, Davidsonville Elementary School, 962 West Central Avenue, Davidsonville, MD. The Expo features awareness about environmental issues, children’s activities, free native tree give-aways, Bay-friendly lawn and landscape techniques, and more. Environmental Film Festival in the Nation’s Capital — various venues from March 18 – March 30. The theme of the 2014 Festival — Our Cities, Our Planet — will examine the challenges posed by Earth’s urban environments and the efforts of the world’s cities to balance environmental and economic needs. The third time is the charm – after proposing offshore wind bills in 2011 and 2012, Governor Martin O’Malley’s Maryland Offshore Wind Energy Act of 2013 passed in the Maryland Senate on March 8. The vote, which had a large favorable margin in the Maryland House, passed in the Senate 30 to 15. The passage of this bill would allow Maryland to hire a private developer to build a series of turbines off the coast of Ocean City. The higher rate for offshore wind, and the cost of development, would require Maryland residential ratepayers to pay an additional $1.50 a month after the turbines are constructed. Maryland businesses would also pay a monthly surcharge of 1.5 percent. O’Malley has framed the monthly charge as a low but necessary cost in establishing an industry in Maryland that has both high potential for green energy but comes with multi-billion dollar start-up costs. Maryland joins several other states including New Jersey in establishing “carve-outs” for green energy in their state energy budgets. These carve-outs have driven growth in other states, and wind energy advocates hope that the bill will kick-start the offshore wind industry throughout the mid-Atlantic region. Mike Tidwell, executive director of the Chesapeake Climate Action Network, is optimistic about the effect the bill will have on Maryland’s economy, stating that “it’s a driver of innovation that will create jobs, enhance our economy, improve public health, and protect the climate.” For more information on the bill, read the Washington Post article here. Visit the Chesapeake Climate Action Network to find out how to thank your Senator for their vote. In an editorial published March 11, the New York Times urged President Obama to reject the pipeline that would funnel Canadian tar sand oil across the United States to the Gulf of Mexico. The Times editorial comes shortly after the State Department’s report stating that the pipeline would have little environmental impact because Canada would develop the tar sand oil with or without the pipeline, therefore building it or not would have no long-term effects. The Times, however, points out that rejecting the pipeline would require Canadians to “play a larger role in deciding whether a massive expansion of tar sands development is prudent.” The lack of a U.S. pipeline would force Canada to build one that spanned their own provinces, a project that has already been delayed due to concerns about the potential environmental impact. The proposed Keystone XL pipeline would traverse 875 miles of the United States and transport 830,000 barrels of crude oil daily to refineries on the Gulf Coast. The process of extracting, refining, and burning tar sands oil is a dirtier process than that for standard crude, yielding annual greenhouse gas emissions that are roughly 17 percent higher. Additionally, the tar sands and the boreal forest that holds them are major carbon sinks; by extracting the tar sands we both add carbon to the atmosphere and take away a method of removing it. The Times urges President Obama to reject the project, stating that “a president who has repeatedly identified climate change as one of humanity’s most pressing dangers cannot in good conscience approve a project that can only add to the problem.” Read the full editorial at the New York Times. Environmental activist Tim DeChristopher was sent to jail at age 21 for bidding on, and winning, millions of dollars worth of land parcels under false pretenses at a Bureau of Land Management auction. His actions drew ire from gas and oil companies, and applause from environmentalists; Bidder 70 documents DeChristopher’s trial and conviction. 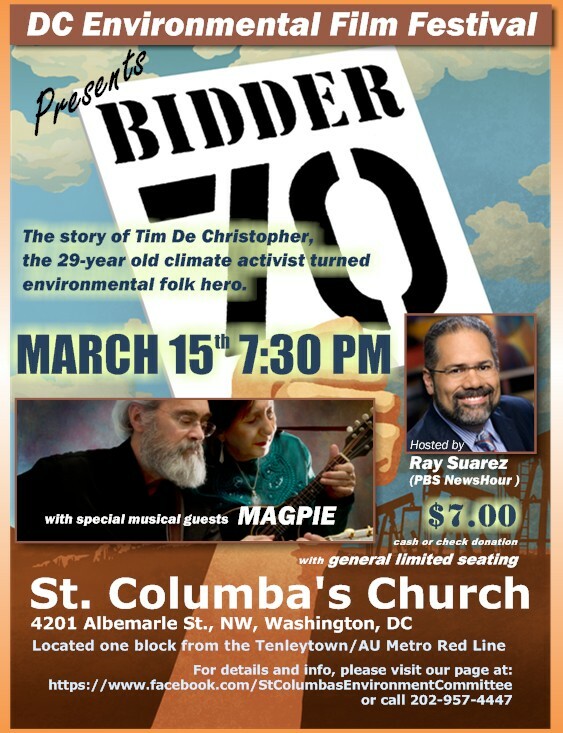 Part of the DC Environmental Film Festival, Friday’s screening will be hosted by Ray Suarez and feature musical guests Magpie. Tickets are $7 at the door, seating is limited. For more information on the screening, please visit the event’s Facebook page. Join the Montgomery County Sierra Club, the Montgomery Bird Club, and the Department of Environmental Protection to remove invasive plants from the Blue Mash Nature Trail. The area, a haven for birds and wildlife, has seen its bird diversity drop off due to non-native plants. Bring your clippers, saws, and loppers, and help restore a wildlife habitat. For more information and to RSVP, please visit here. Montgomery County Division of Solid Waste Services presents a workshop featuring information on implementing a successful recycling program in the workplace. Learn about Montgomery County’s recycling requirements, how to reduce waste, and where to buy products made from recyclable materials. The cost is $10 per person. For more information and to RSVP, please visit here. Susanna Parker is a recent college graduate and volunteer with Bethesda Green. Her interest in sustainability leads her to look for green solutions in uncommon places. President Barack Obama has officially nominated Gina McCarthy to serve as the administrator of the Environmental Protection Agency. McCarthy, former assistant administrator of the EPA’s Office of Air and Radiation, would replace current head Lisa Jackson, who announced her resignation in December. Despite a strong record and endorsements from a variety of environmental organizations, McCarthy is likely to face opposition from congressional Republicans, who have opposed EPA regulations in recent years. However, among the industries regulated by the EPA, the Washington Post reported that coal was the only likely dissident to McCarthy’s nomination. For more information, check out the full article on The Huffington Post. District Gas Leaks the Answer to Key Policy Question? As natural gas production expands in the United States, the question most asked is whether the benefits outweigh the dangers. According to a recent Washington Post article, scientists involved with the Environmental Defense Fund are embarking upon a two-year, $10 million effort to measure methane emissions along the nation’s supply chain. This includes measuring methane leaks from city pipelines, beginning with Boston and the District of Columbia. Methane is the main component of natural gas and is 25 times more powerful at trapping heat than carbon dioxide. Unlike carbon dioxide, methane dissipates from the atmosphere within a few decades; however, it continues to drive global warming. The amount of methane that leaks along the nation’s natural gas supply chain could offset the advantages that natural gas has over coal. Representatives of the Environmental Defense Fund stress the importance of obtaining accurate data before policy is set. The EDF has recruited industry experts and academics to track the stages of natural gas production, from extraction to transmission, and plan to release an initial report this May. Possibly more important than the stages of production is the data on leakage in city pipelines. According to recent studies, the District has over 3,000 leaks throughout its infrastructure. Boston University professor Nathan Phillips, head of the pipeline leak study in DC, said that the leaks represent a waste of resources, and argued that gas exploration would not have to expand so rapidly if we could conserve our current supply. For more information on the studies, please read the full Washington Post article here. Join us on the second floor of BlackFinn to celebrate our 5th anniversary! Bethesda Green Executive Director Dave Feldman will speak and provide an opportunity for you to share your thoughts on our next five years. In addition, there will be casual conversation, networking, complimentary appetizers, Happy Hour drink prices, and a raffle to win a $50 BlackFinn gift card. $5 at the door, to RSVP please visit the Bethesda Green Meetup. Join Chesapeake Climate Action Network and involved Maryland citizens in the biggest fracking rally Annapolis has ever seen! Critical deadlines for passing the moratorium on fracking are fast approaching, but the chair of the Senate committee said that the moratorium bill will not get a vote this year. Major fracking bills were buried by this same committee over the past two years, but we’ve learned that grassroots pressure can alter the course of bills in Annapolis. Stand together, and show the State House that just as we deserve protection from the risks of fracking, we deserve a vote on it as well. For more information, and to RSVP, please visit the Chesapeake Climate Action Network. Join Maryland Governor Martin O’Malley, Delegate Tom Hucker, Annapolis Green, and Bethesda Green for our Annual Green Business Night in Annapolis! Meet legislators, representatives from state agencies, environmental allies, and green business representatives. Network with green allies, learn about business opportunities, and hear updates on bills to advance geothermal and solar energies. The event is free, but please RSVP to secure your name tag, parking information, directions, and the event program. The Montgomery County Department of Environmental Protection and the Washington Suburban Sanitary Commission present the “H2O Summit” — an educational festival about clean water in Montgomery County. The morning session will feature panels and discussions on important watershed topics such as stormwater education, water quality improvement, and stream health, while the afternoon festival will be full of exhibitors, children’s activities, and hands-on family friendly activities. The event is free, but space is limited, so be sure to RSVP today! Part of the DC Environmental Film Festival, this series of short films is presented in conjunction with the Anacostia Community Museum and their exhibition, “Reclaiming the Edge: Urban Waterways and Civic Engagement.” The films include stories of urban wildlife found along the Anacostia River, the importance of changing the way we view the restoration of the river, and a variety of shorts from the Riverstories Series. The event is free; no registration is required. For more information, please visit the event page here. This year, the Environm ental Film Festival celebrates its 20th Anniversary in the Nation’s Capital. The festival runs March 13-25, 2012, and features 180 documentary, narrative, animated, archival, experimental and children’s films. Most screenings include discussion and are free. Bethesda Green is participating in the discussion after the Thursday, March 15, 7 pm showing of Cape Spin: An American Power Struggle at St. Columba’s Episcopal Church, 4201 Albemarle St. NW, Washington, DC, near the Tenleytown/AU Metro station. Cape Spin examines the unusual political alliances lined up for and against a major wind farm proposed for the middle of Nantucket Sound.